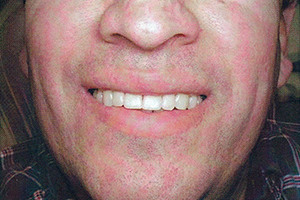 A flexible partial with a natural tissue blend effect and translucency exclusive to Valplast® that picks up the patient's natural tissue tone with no metal clasps to announce where the partial begins. Just imagine the confidence patients will have. Patients love the aesthetic excellence of Valplast® every time they look in their mirror. It gives them the confidence they need to face the world. It's a feeling they wouldn't expect from a removable partial. Valplast® is the aesthetically pleasing partial. Designed for the utmost in functionality, Valplast® is formulated to provide the needed strength without bulkiness. 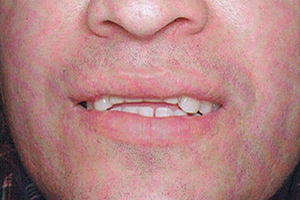 Patients can confidently resume normal and comfortable mastication very soon after the insertion of the prosthesis. In addition, the flexibility of the resin achieves the effect of a stress-breaker without complicated attachments. The gum tissue is gently stimulated under mastication, and unnatural teeth are substantially reduced. The strength of the material and resistance to chemical breakdown provides a long-lasting, unbreakable partial. Compared to conventional partials, Valplast® uniquely distributes the stress more naturally in the mouth. The remaining teeth and gums typically stay healthier longer than with a conventional partial. Valplast® functions for the patient's comfort, confidence, and oral health. Take decades of research, add years of refinement, mix with determination, experience, and perseverance. The result: The Valplast® Flexible Partial, the leader and original flexible dental restoration in our industry. That's why Valplast® International is so proud of its product, and why its quality remains unsurpassed. Valplast® exercises the strictest quality control with every unit of material, designing the color to match the visual effect of veined gum tissue. Our techniques allow the processing laboratory to add any number of teeth or retention to an existing partial without sacrificing security. Valplast® International Corporation is continuously expanding its technical support network to keep processing laboratories up-to-date on Valplast® techniques and products. This assures you that your processing lab has easy access to the latest technical advancements and our staff of experienced and knowledgeable technicians and instructors. This means total confidence for your patient. All our work and effort goes into your patient's satisfication with their Valplast® restoration. Valplast® Flexible Partials are a value alternative to costly work involving implants and fixed restorations. Although slightly more expensive than conventional partials, Valplast® offers a premium product with far more benefits in aesthetics, function, comfort, and reduced chairtime. Patients prefer Valplast® over conventional partials, and many partial-wearers have their prostheses converted to Valplast®. By offering Valplast® you can add value to your practice. You get quality, aesthetic restorations at an affordable price . . . but that's just the start of the value in a Valplast® Flexible Partial. tcs® Unbreakable is manufactured in the U.S.A. from the highest quality materials. 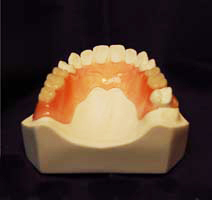 Replacing or repairing broken partials is expensive and inconvenient. Patients have to be without their partials while they're waiting for them to be repaired. That's why patients appreciate that tcs® Unbreakable won't break if they're dropped or mishandled. 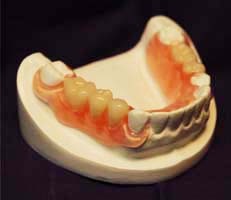 Because they're so much thinner than bulky acrylic denture bases, tcs® Unbreakable RPDs are comfortable right from the start. Patients get used to them quickly and soon forget they're wearing them! tcs® Unbreakable blends naturally with the surrounding tissue and gums. In fact, they're practically invisible. Younger patients will appreciate the natural look of tcs® Unbreakable. Our strict quality control means they don't vary in shade, you can always count on consistent color. tcs® Unbreakable RPDs are biocompatible, making them ideal for patients who are allergic to monomers found in acrylic dentures. tcs® Unbreakable is ideal for patients who want an aesthetic solution without the cost associated with C&B or implants. Unlike permanent tooth replacement options, tcs® Unbreakable is non-invasive. Matching shades is easy with tcs® Unbreakable. Because they're translucent, they blend in with the patient's natural dentition. We supply free shade guides in light pink and standard pink, as well as light/dark pink and dark pink for ethnic shades. We offer free patient education brochures full of helpful information for your waiting room. Quality customer service is among the top priorities at tcs®. Our expert support consultants are available to answer all your questions regarding tcs® Unbreakable. They are also available to consult on complex cases. Millions of tcs® Unbreakable partials have been prescribed, and this number is rapidly growing. When you specify tcs® Unbreakable, you can be assured you're getting the proven quality and reliable service from one of the leading manufacturers of dental products. We think you'll agree that superior aethetics and comfort make tcs® Unbreakable the clear choice!